Poison and Cheap Trick kicked off their summer tour of North America in Irvine, CA on May 18, and video from opening night is available online. Cheap Trick’s hour-long, 13-song set at the Five Point Amphitheatre mixed classic tracks with covers of tunes by The Move (“California Man”), Fats Domino (“Ain’t That A Shame”), and the Velvet Underground (“I’m Waiting For The Man”). On the day of the show, the Rockford, IL band released a new single, “The Summer Looks Good On You”, as the first preview to their forthcoming 20th studio album, although they didn’t include it on opening night. 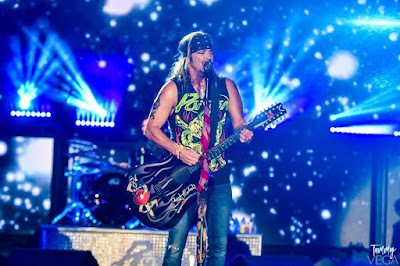 The Nothin’ But A Good Time Tour sees a return to action by Poison following a 30th anniversary run in 2017 that marked the first time in over five years that the group hit the road with its original lineup of vocalist Bret Michaels, guitarist C.C. DeVille, drummer Rikki Rockett and bassist Bobby Dall. The pair will play more than 25 dates by the time the tour wraps up in Hollywood, FL on July 1.